Well, first of all, it has been a LONG time since I made a post about projects we’ve been doing around the house! Time really got away from us for a few months-I guess that’s what happens when you’re both working full time, going to school, and one of you is pregnant! Morning sickness is REAL and really hindered any motivation I had to do things around the house for a while. But anyways, about a month and a half ago we finally got our acts together and started renovating our master bathroom. It took us a while to finish this project-but I think the outcome is BEAUTIFUL and it’s a space I love being in now. What these pictures don’t show you is that the cute separate vanity area was CARPETED-which kind of defeats the purpose. I refused to use that area once we replaced the carpet because I didn’t want to ruin our new carpet with my makeup (I use mineral makeup & it always gets everywhere). The vanity area was also separate from the bathroom with a door between them. When we purchased the home we painted the vanity area the same color as our bedroom since it was really part of that space. We didn’t paint the actual bathroom until recently because we weren’t sure what we were going to do with the room. As you can see, the vanity area was right by our bedroom in that little nook. It’s a nice space with a large mirror, but the light fixture was outdated & ugh-carpet. We decided to tear down the wall between the vanity space & the bathroom to create one large master bathroom. We also wanted to move the door to the bathroom to the other side of the vanity so that the entire space was closed off from our bedroom. When the wall was torn down we immediately LOVED the effect. The room felt so open and wonderful. The next steps involved moving around some electrical wires (to relocate the light switch), then the rest of the DEMO. We removed the toilet, tore up all the tiles from the floor and baseboard, took down all the towel hooks and other accessories, and removed all the light fixtures and faucets. Unfortunately, I do not have a lot of pictures of these steps because my husband and his dad did pretty much all this work! Being pregnant meant that I was banned from the bathroom for much of this process. 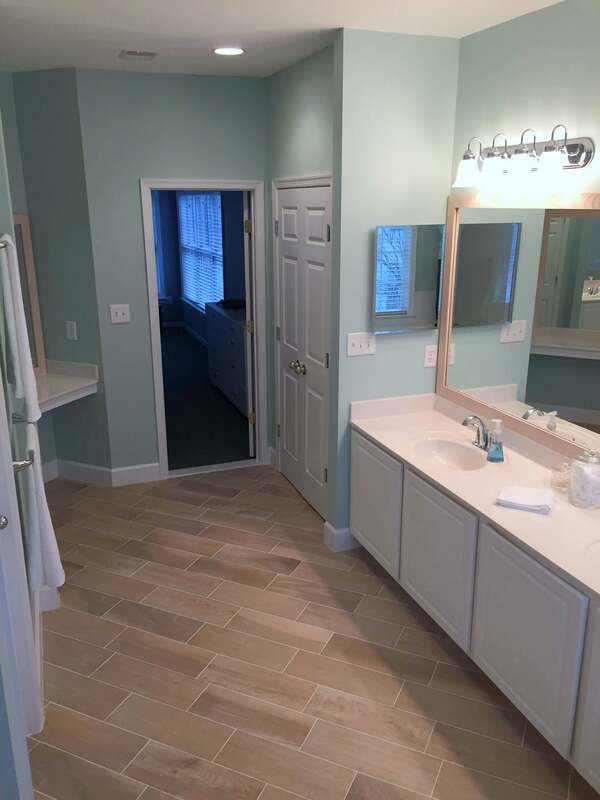 We used the same tile and paint color that we used in our guest bathroom. The paint color was Tide Pools by Behr. We really loved the calming effect this color gave to our guest bathroom so we decided to use it again. I’m pretty sure my husband wants to put it in every bathroom we’ll ever have! For the floor we used ceramic tiles that looked like hardwood. I love how it gives an element of nature to the space. We used the Kohler Alteo collection for our sink faucets and accessories (towel bars and toilet paper holder). My favorite part of the toilet paper holder is how it opens up! Makes it SO EASY to change the roll when it’s empty. Of course, my super talented husband made some mirror frames for this space as well. The frames really make the mirrors pop and stand out against the walls. We also replaced the light fixtures with these from Home Depot. Seriously, we were at Home Depot SO MANY TIMES during this renovation. I considered asking for our own special parking space! 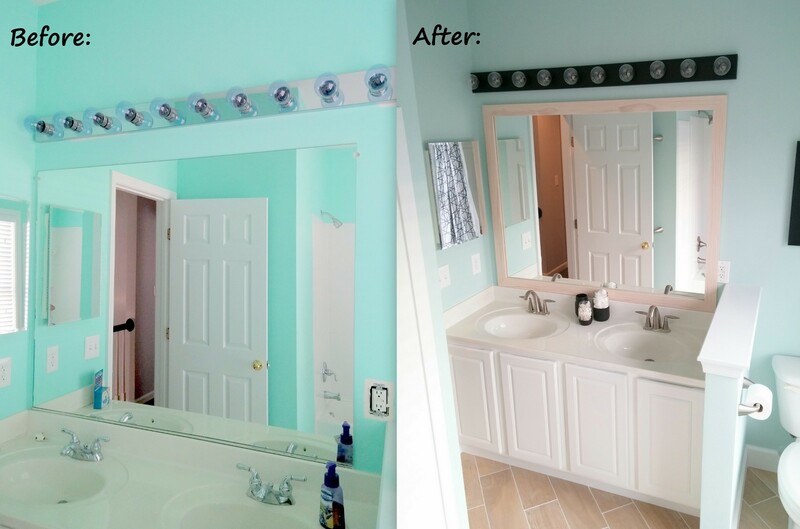 If you would like to read the process for replacing the tile floors, creating the mirror frames, please read my post about our Guest Bathroom! It contains all of the directions for what we did.